The City of Boston has allowed National Grid to begin construction of its Back Bay Billionaires’ Pipeline, ignoring the usual winter moratorium on construction, ignoring the unanimous City Council resolution that no decision be made without a robust public conversation, and in spite of the fact that the Attorney General has recommended that the DPU reject the sweetheart financing arrangement. We will bear witness and make known our opposition to this terrible project that will poison our city and our planet. 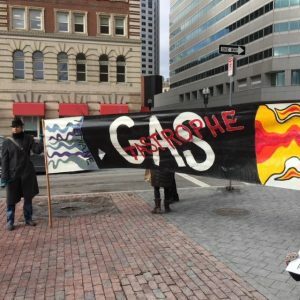 Fracked gas is not a “bridge” fuel. We call on our Mayor and elected officials to initiate a moratorium on all fossil-fuel expansion. Join us for this first standout; bring signs, make your voice heard.